There's a huge unanswered question over any future referendum on the EU here in the UK; who can vote? Current arrangements are that all EU citizens registered to vote in the UK can vote in local and European elections. Only UK and Commonwealth citizens can vote in general elections or by-elections. There are two massive problems with this in practice; the first is that the standard of accuracy of our electoral registers is of third-world standard, the second is that even illegals and overstayers can vote. Firstly, the Commonwealth. I believe the Commonwealth has the potential to be as important as Europe in terms of our trade and prosperity; the scope for defence and reciprocal arrangements is also huge and beneficial, and the global Anglophone alliance a source of strength. I fully support the tradition of young single people from the Commonwealth spending a year or two in the UK, whether working behind bars or as management accountants for one of the temp agencies or in the NHS. However, I've never understood the need for Commonwealth citizens to have the vote here, or for UK resident citizens to have the vote in Nigeria or Tonga. Since Labour abolished exit controls, and as there's no link between the electoral registers and the immigration database, it's quite possible for illegal overstayers or those with fraudulent identities to infect the probity of our voter base. So we must end the right of Commonwealth citizens to vote in the UK. So a great clear-out of the registers is also urgently needed. I suggest this takes place very quickly, alongside the 2011 census, with a once-only requirement for UK citizens to provide evidence (passport or birth certificate) of citizenship. And as to who can vote in any referendum on the EU - whether before or after the Lisbon Constitution Treaty is signed - clearly, this should be UK citizens only. It's still our country. As Vernon Bogdanor points out in this morning's Telegraph, "In 2005, (the Conservatives) won more votes than Labour in England but 92 fewer seats. In 2010, for the Conservatives to gain the same number of seats as Labour, they need to win around two million more votes." For anyone who wonders at this third-world bias in our electoral system, look to the glacial pace at which our mummified Boundary Commission moves in re-drawing constituency boundaries to take account of population shifts. The answer isn't to throw out our well tried and tested First Past the Post system, but to put some ginger in the rectums of the gerontocrats on the Boundary Commission. The Electoral Quota, the number of electors per constituency that should define the boundaries of each seat, is currently around 69,000. In Australia, this is not allowed to vary by more than +/- 3.5%, and in New Zealand it's 5%. If 5% were applied to the UK, all seats with fewer than 65,550 electors or more than 72,450 would be re-drawn. As Michael Pinto-Duschinsky pointed out to the Graham Committee, we're off the radar as far as international standards of fairness go. It's also high time we reduced the number of MPs to around 550 or so. This would give us a national Electoral Quota of 82,000. And this must be done by 2015. The nation should not have to endure any more than just the next bent and skewed election. It's a disgrace and it needs urgent action. This blog has long recommended the establishment of Community Settlements to house and care for unsupported single mothers, economic and health migrants with no skills or who arrive here with debilitating illnesses for treatment at our expense, and those of the underclass incapable of productive work. Ours is a Christian nation, and none, whether illegals or the most disruptive underclass scum of the type that hounded Fiona Pilkington to death, should be thrown on the street without food, warmth and shelter. Our proposals have always assumed voluntary entry into such settlements; when free council housing and levels of benefits that provide a comfortable life for millions of the idle, the stupid, the cheats and the chancers are gradually withdrawn and run down, those genuinely incapable of supporting themselves must be provided with food and shelter, albeit at the most basic level of subsistence. However, we've never proposed this as a punishment for being a single mum or anything else; women have full control of their own bodies and what they do with them. Including bearing bastards. If they have a supportive family structure that cares for them and their offspring at no cost to the taxpayer, that's fine with me. Brown, however, wants to force 16 and 17 year old single mums into hostels as a punishment - with no choice or freedom about it. We should not forget that Oswald Mosley, the last British Nazi to achieve prominence, was a Labour MP and Minister, and that the roots of fascist totalitarianism lie close to Labour; there's not a fag-paper between National Socialism and Fabian Socialism. As Brown continues to triangulate Labour pronouncements with those of the BNP, to which his party is haemorrhaging votes, expect to see more of this sort of stuff over the next seven months. Paul Waugh reports in tonight's Standard that Blair is set to be named EU President within weeks if the Irish vote 'Yes'. Fine. That sealed indictment from the International Court in the Hague will that much easier to process, then. 69,456,897 Americans voted for Obama in 2008. That's 69,456,870 votes more than it will take to 'elect' Blair as EU President - for we, the people of Europe, won't get a say. The institution and its offices are as totalitarian and undemocratic as the worst of any South American banana republic. Oh dear. 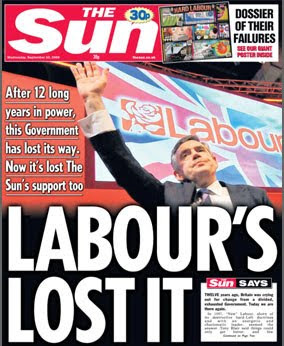 Following the Guardian's editorial earlier this year encouraging a Labour coup against Brown, he's lost the Sun. Not even a series of Chequers weekends for the scion of the Murdoch and Sun editors could prevent the inevitable. Murdoch watched Brown's speech, and decided he was a loser. Murdoch didn't make his fortune by backing losers. Brown was sacked. Still, Paul Dacre manages the odd editorial in support of Brown in the Mail, which, like most papers, has suffered a 9% downturn recently. And the Telegraph, to the fury of its readers, also lends a clothes-prop to the waxed dummy from time to time. Kinnock is said still to feel deeply hurt at having his head in the Sun's lightbulb on the eve of that disastrous election. Their treatment of Brown today is a little kinder - but he'll still feel it like a kick in the gonads. If there's one thing more calculated to wound than faint praise, it's overdone denial. As Mandy now tours the news studios and with feigned indignation repeats to millions of viewers who missed the Andrew Marr show that 'Gordon is not mad, not mad at all. Quite sane and getting on with the job.' you just know that the 'Gordon is mad' meme will now embed itself in the public's consciousness. Spanish vultures have bloody good eyesight. They can spot carrion from 10,000ft up, and then glide silently on nine-foot span wings down to feast. For generations they have lived symbiotically with Spanish hill farmers and rural populations; villagers used to take the carcasses of dead animals to Muladares, traditional places at which they were left for the vultures to dispose of, and hill farmers who practiced transhumant grazing were able to leave the carcasses of dead sheep on the high pastures for the vultures to clean up. All changed from 2002 onwards, when the EU passed a series of new laws in the wake of the BSE scare. It was forbidden to feed the carcasses of ruminants, or indeed any animal by-products, to wild birds. The papers gleefully reported that giant flocks of hungry Spanish vultures were flying to Brussels and Germany to look for food. It was too good a story to miss. In vain did EU officials protest that special conditions existed for endangered species and birds of prey; Spanish vultures were not an endangered species - indeed, the population had been growing - and carrion-eaters are not strictly birds of prey. It seems the Spanish vulture is doomed by Euro bureaucracy for failing to comply with a legislative category. And now for Bystander. The Magistrate blogged lately that he had been throwing meat scraps out in the garden for the Red Kites. Immediately I realised that this activity fell under the 2005 Animal By Products Regulations (SI 2005 No 2347). The meat scraps - trimmings from meat fit for human consumption - are Category 3 material under the regulations; they are classed as catering waste, even from a domestic kitchen, and are therefore subject to the Regs. On the face of it, there is a clear breach of s.9(1) of the Regulations, which prohibits the feeding of catering waste "to any other ruminant animal, pig or bird". The offence is regarded as fairly serious, with a penalty on summary conviction of a fine not exceeding the statutory maximum or to imprisonment for a term not exceeding three months or both(s.48(1)). Penalties on indictment are even worse. However, all is not lost for Bystander. The derogation that failed to work for the Spanish vulture may work in the Chilterns. S.26(3) of the Regulations allows "The feeding of animal by-products to ..... reptiles and birds of prey other than zoo or circus animals" when authorised by the Secretary of State. Unlike vultures, Red Kites can be classed as birds of prey (they apparently eat worms and mice as well as meat scraps). I have no doubt that Bystander will now apply to the SoS for the appropriate licence, and regularise his kite feeding. And equally no doubt that if he does, he will cause immeasurable consternation and confusion in DEFRA, who I am sure pass these wretched laws without ever reading them. As big as the Stasi was, it depended on a myriad of small time informers to rat on their colleagues and neighbours to work. The fear in the German State was never knowing whether that smiling newspaper seller, or that friendly primary school teacher, was watching for a loose word, a small admission of guilt to report. The State encouraged fear and distrust amongst the people. Like most normal people, I swear at my telly from time to time. At times, in private, my language is neither polite nor politically correct. And now, following the case of Rowan Laxton, I must ensure the windows are closed and that I am inaudible to any other person, or face the risk of a rat reporting me to the police. Rowan has just been fined £350 with £500 costs and a £15 victim surcharge (which will certainly never reach the Palestinians on whose behalf he shouted in the first place) for being overheard. Again a story from the Times on how Harriet Harman fixed for her hubby to get a safe Labour snout-in-the-sleaze-trough seat in return for a £1m 'bung' from his union's funds. This is the same Harriet Harman beloved of Labour wimmin everywhere for her shrill ranting in favour of all-women candidate lists and against, er, wealthy white middle-class blokes getting all the swill. Harman's stunning hypocrisy will no doubt not show a trace on her dull ovine features; the Harmans of this world, like Leona Helmsley, all believe that rules are for other, 'little' people like us, and don't apply to them. Will 'magic passport' mean DNA swabbing for Scotland? And so it emerges that the Tongan alleges that she never showed a passport at all to Patricia Scotland, and was given the job after a ten minute interview. If Scotland had seen Tapui-Zivancevic's passport - with its out of date visa - she wouldn't have employed her, clearly. But Scotland now claims she was shown a second, magic passport - invisible to everyone but her. The UK Borders Agency's unseemly haste last week in imposing a £5k civil penalty on Scotland was for a very good reason. If they had grounds to suspect that Scotland knowingly employed an illegal, such as the magic passport, they would have had grounds to arrest and question her under caution and to swab her for DNA and take her prints. And of course even if no charge was ever brought, the Attorney General's DNA would be retained. When Vernon Coaker was a Home Office minister he vigorously defended DNA retention of unconvicted people because of the high risk that they would 'offend again'. In the government's view, then, its own Attorney General would be branded a habitual criminal, despite not having been convicted. And even Brown's corrupt, sleazy and utterly bankrupt administration couldn't defend that.